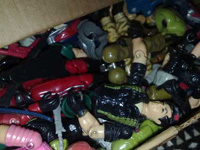 I wrote a while back that I was planning to post up my GI Joe collection in this blog but had to fix the figures first because the rubber bands have already deteriorated. 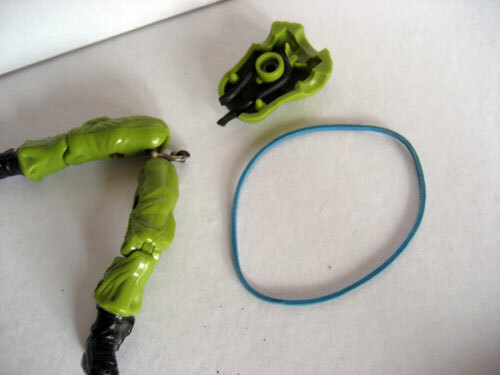 I wrote on that post a method to fix the broken rubber band in the Real American Hero figures of GI Joe. I actually wanted to try fixing Flint first, since he's my most favorite figure. I couldn't find all of his parts yet, so I decided to try it instead on his paramour, Lady Jaye. So the first thing I did was to remove the back screw in the figure. 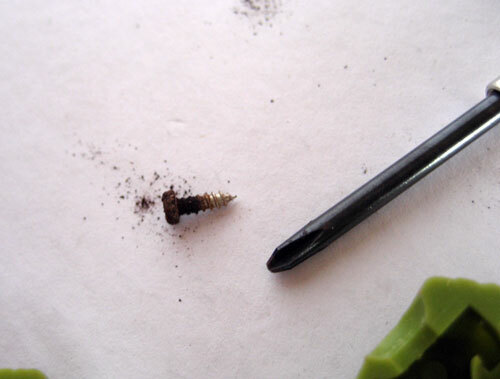 Its quite small so you will need a very small star screw. 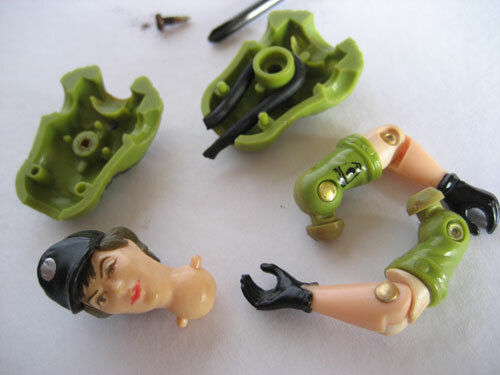 Lady Jaye is then opened up and the arms and head will fall off, be sure to keep tabs on them. Next I got an ordinary piece of rubber band. This was the uber-cheap type where you could get a pack for just $0.50. Thinking about it now, I think it would have been better to use those thick long office type of rubber band that are latex free. 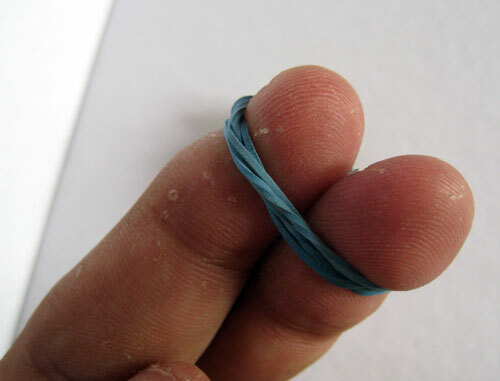 I then loop the rubber band between my two fingers till it becomes tight. I have small fingers and two of them together I estimate to be the distance between the knob on the torso and the hook at the legs, where the ends of the rubber band are supposed to go. I connect one end of the rubber band at the hook in the leg. 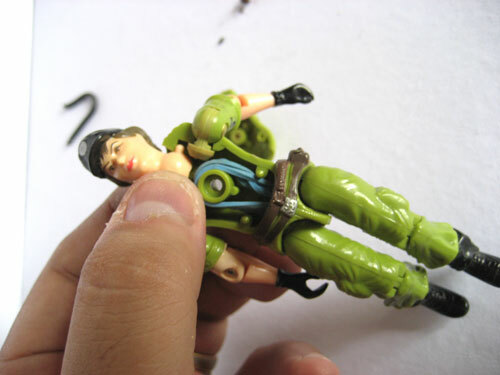 I then get a very small long nose pliers so that I can pull the rubber band through the hole in the hip part of the figure. 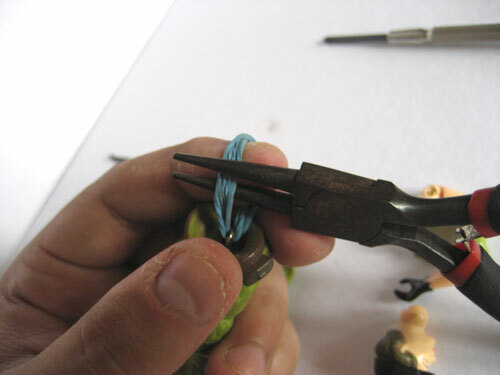 The type of long nose pliers I used was that used by jewelry makers to twist links to make the chain in a necklace or bracelet. 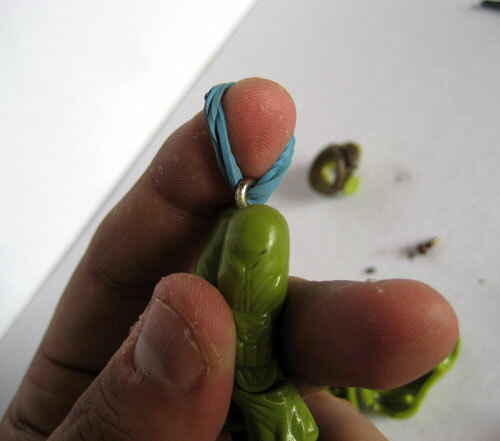 I then loop the other end of the rubber band to the knob on the torso. I tried attaching the chest plate last after putting in place the arms and head but found it to be difficult because they kept falling off. So what I did was to place the front chest piece first then just push the arms and head through their respective holes. Pushing the arms and head in would cause the chest piece to open up a bit but not enough that the rubber or other parts would fall off. 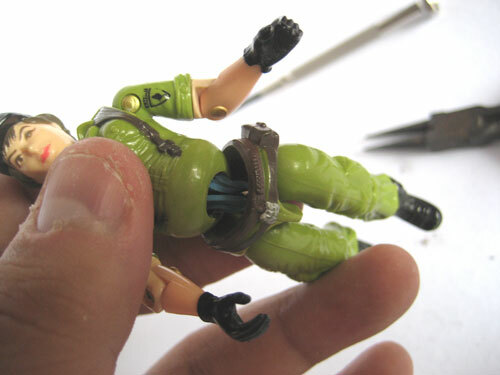 After the arms, head and front chest piece are in place, I screw on the back screw and check if the play is just right. 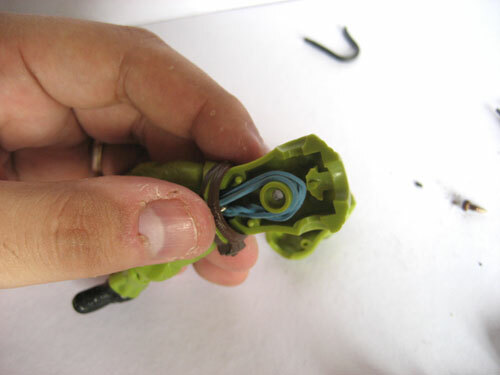 If its on too loose there is a tendency for the rubber band to unhook from the legs, too tight and you might have a hard time moving the joints. 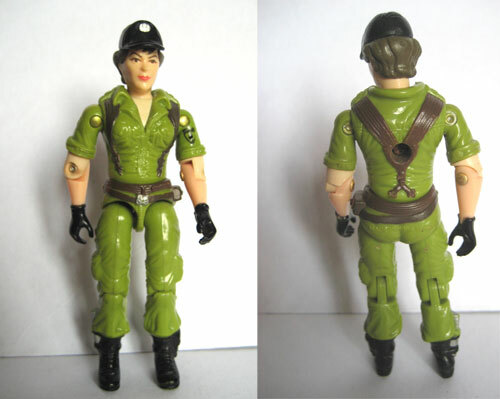 And here we have Lady Jaye, back together again like Humpty Dumpty.